In the last decade, many countries in Southeast Asia have formulated new policies in response to the changing strategic environment shaped by the balance of power in the Asia-Pacific, including in the South China Sea. In particular, the final award in the arbitration proceedings in The Hague on July 12, 2016, marked a historical event that has new and major implications for the Asia-Pacific. Despite the importance of the recent ruling, however, Malaysia’s approach to the South China Sea dispute, as outlined below, has remained constant. As a pivotal, nonaligned country in the Association of Southeast Asian Nations (ASEAN) with sovereign claims in the South China Sea, Malaysia upholds its approach to ensuring the continuity of regional stability and will play a role in steering the region away from conflict. 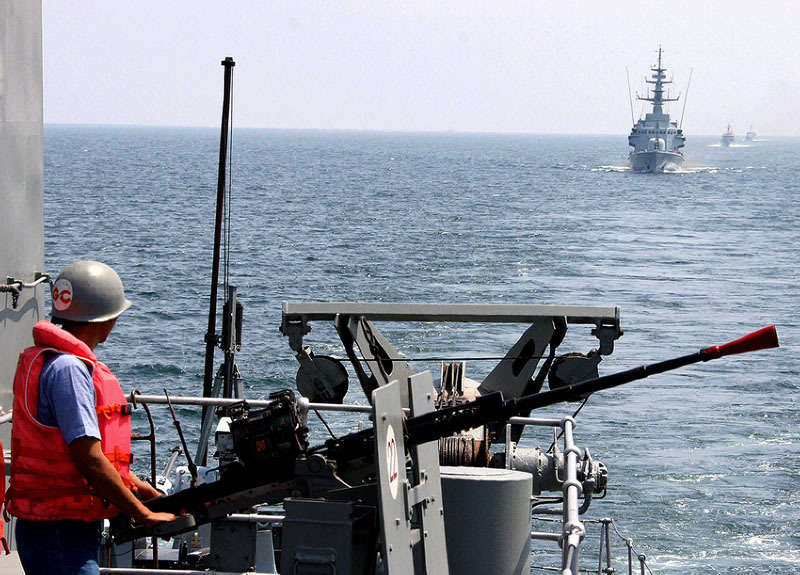 A Philippine Navy gunboat patrols the Visayan Sea on April 14, 2007, as a Malaysian Navy vessel follows as part of a joint naval training exercise. STR/AFP/Getty Images. The case, brought by the Philippines in 2013, sought a determination from the tribunal seated at the Permanent Court of Arbitration in The Hague on China’s claims to historic rights within its nine-dash line. It also sought to establish the status of certain maritime features claimed by both China and the Philippines and whether those features are capable of generating maritime zones. In addition, the tribunal was requested to rule on whether China had interfered with the exercise of the Philippines’ sovereign rights and freedom to fish, as well as whether China had harmed the marine environment. Finally, the Philippines sought a ruling over whether certain actions taken by China, in particular its large-scale land reclamation and construction of artificial islands in the Spratly Islands, unlawfully aggravated the dispute between the two countries. The award is seen by many as overwhelmingly in favor of the Philippines, with the most critical decision being the tribunal’s ruling that China’s claim to “historic rights” within its nine-dash line has no basis and is not compatible with the 1982 United Nations Convention on the Law of the Sea (UNCLOS) that China ratified in 1996. The tribunal ruled that the features of the Spratly Islands—including those occupied by China—are all either rocks or low-tide elevations (LTE), and that none are sufficient to claim an exclusive economic zone (EEZ) or continental shelf. Unexpectedly, the court also ruled that Itu Aba, the largest feature in the Spratly Islands, is not an island and cannot generate an EEZ or a continental shelf. In its natural state, there is evidence that Itu Aba can sustain human habitation, but not communities, and it cannot sustain human life or economic activity on its own. The court ruled that Scarborough Shoal—the disputed shoal that led the Philippines to initiate the arbitration—Johnson Reef, Cuarteron Reef, and Fiery Cross Reef are high-tide features, and that Subi Reef, Hughes Reef, Mischief Reef, and Second Thomas Shoal are LTEs that are naturally submerged at high tide. Therefore, Mischief Reef, where China has a military garrison, is within the Philippines’ EEZ, which informs the tribunal’s finding that China’s 1995 occupation of the reef was a violation of the Philippines’ rights within its EEZ. On issues of environmental harm and maritime law enforcement, the court found that China’s land reclamation projects have damaged the environment and that Chinese maritime law enforcement units have unlawfully harassed Philippine fishermen. Following the tribunal’s decision, China reiterated its staunch position of nonacceptance and nonrecognition of the award and declared that the decision on the overlapping disputes is null and void. China’s Ministry of National Defense also reiterated the nation’s stance on territorial sovereignty and maritime rights and interests in the South China Sea. These statements reaffirm the reality that China is a major factor and determinant in ensuring a peaceful security environment in the Asia-Pacific, and that the current state of affairs is tending toward confrontation rather than cooperation and accommodation. Malaysia’s Prime Minister Najib Razak gestures to China’s Premier Li Keqiang during a meeting in Putrajaya on November 23, 2015. MOHD RASFAN/AFP/Getty Images. The award can be analyzed from the perspectives of law, geostrategy, national interest, and regional cohesiveness. Claimants to disputes in the South China Sea such as Malaysia, Vietnam, Brunei, and the Philippines are analyzing the verdict from their national positions of interest, while ASEAN as a whole is primarily concerned with possible reactions and the potential for heightened tensions in the area. Although not directly involved in the arbitration, Malaysia has expressed concerns regarding the ramifications of the award and has called for the full and effective implementation of the Declaration on the Conduct of Parties and an early conclusion to the code of conduct currently being discussed between China and ASEAN. Malaysia has also maintained that diplomatic and legal processes, respect for international law, and UNCLOS should prevail and has urged all parties to exercise self-restraint. Malaysia has demarcated the geographic extent of its vital interests, which includes certain features of the Spratlys. Within Malaysia’s maritime zones, it asserts all rights enshrined under international law and particularly as set out in UNCLOS. These include its rights to internal waters, territorial sea, continental shelf, and EEZ, as well as control of the airspace over applicable maritime zones. Malaysia’s EEZ, as proclaimed by the executive order Yang di-Pertuan Agong vide P.U. (A) 115/80 issued in 1984, is an area beyond and adjacent to its territorial sea and extends 200 nautical miles from the baselines from which the breadth of the territorial sea is measured. The Exclusive Economic Zone Act of 1984, which provides for the regulation of activities in the EEZ and on the continental shelf, has been deposited with the United Nations. The limits of Malaysia’s EEZ and other maritime areas are encapsulated in the Peta Baru (New Map) published by the Mapping Department of Malaysia in December 1979. Although the limits of the EEZ are not shown in the Peta Baru because the concept of the EEZ had not yet been legitimated by international law, Malaysia submitted a declaration upon ratification of UNCLOS in 1996 that it adopts a single maritime boundary for its continental shelf and EEZ. In this regard, Malaysia is well-positioned legally in that the tribunal’s ruling does not and will not infringe on its interests. Malaysia’s approaches to maritime disputes, security, and policy implementation are based on diverse considerations. The main considerations are protecting national interests, sovereignty, territorial integrity, and national well-being and adhering to and respecting domestic/municipal, customary, and international laws, including UNCLOS as well as other international conventions and regulations related to the management of Malaysia’s seas. 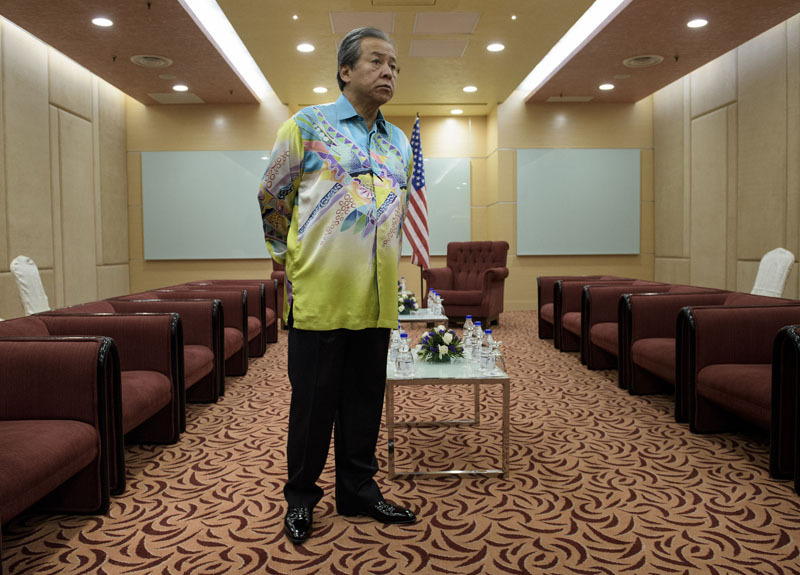 Malaysia’s Foreign Minister Anifah Aman waits for US Secretary of State John Kerry before a bilateral meeting in Kuala Lumpur on August 5, 2015 . BRENDAN SMIALOWSKI/AFP/Getty Images. 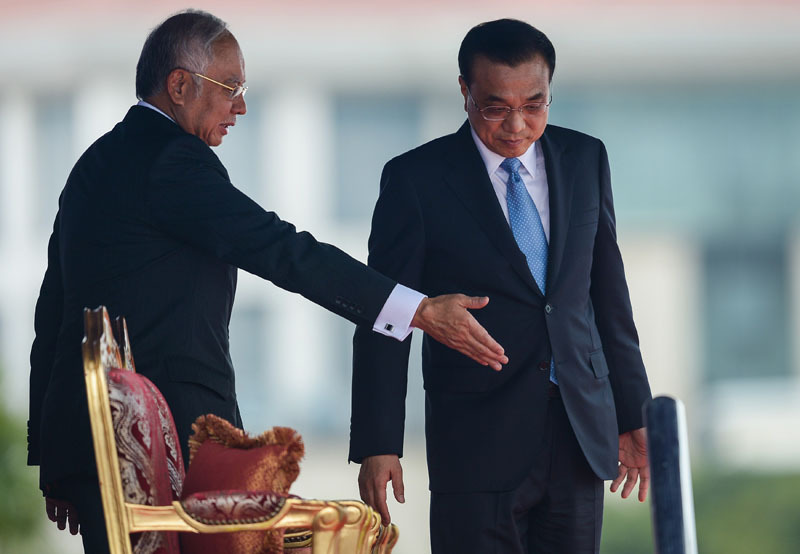 Malaysia generally perceives China’s rise as harmless, given that it is informed by historical experiences in which the two countries have long enjoyed cordial relations. As such, Malaysia expects that, as a peaceful nation, China will not resort to upsetting the stability of the Asia-Pacific. It is worth mentioning that the tribunal award does not perceive China’s assertions in the South China Sea as being based on ill intentions; its actions, however, are not in line with a proper interpretation of UNCLOS. In this regard, the United States, which is seen in Malaysia as an important factor behind the arbitration initiative, should be seen in a positive light as it encourages countries to adopt and adhere to the rule of law. Additionally, U.S. involvement provides some comfort for smaller countries in the face of assertiveness by larger powers. On the other hand, the United States’ involvement in the region and future courses of action could complicate the China-ASEAN process toward dispute resolution in the South China Sea. In this regard, the United States, Japan, and other outside powers should allow the ASEAN-led negotiations and dialogues to take their course and lead the way forward. Sumathy Permal is a Senior Researcher at the Maritime Institute of Malaysia. Banner image: © MOHD RASFAN/AFP/Getty Images. A Royal Malay Regiment Guard of Honour stand at attention before a welcoming ceremony for China’s Premier Li Keqiang on November 23, 2015.